(NaturalNews) Radioactive cesium from the 2011 Fukushima disaster is still being detected in citrus and other plants as far away as Florida, according to a report sent to the U.S. Nuclear Regulatory Commission (NRC). In March 2011, multiple nuclear meltdowns took place at the Fukushima Daiichi plant in Japan. The explosions ejected massive amounts of radioactive material into the environment, most notably radioactive cesium isotopes. In the weeks after the disaster, winds carried airborne radionuclides to every corner of the globe. Most of the radioactivity, however, settled into the Pacific Ocean. The report is Duke Energy Florida's Annual Radiological Environmental Operating Report to U.S. NRC, dated May 5. It notes that immediately following the Fukushima disaster, radioactive iodine and cesium from the plant were detected in Florida vegetation. "The Japanese event also affected broad leaf vegetation sample media throughout the year as long-lived radionuclides (Cs-137) were released at Fukushima multiple times," the report reads. "The vegetation measurements in 2014 are still affected by the Fukushima event due to the long-lived radionuclides deposited. The vegetation control sample station located in Orlando, Fl. is also experiencing similar Cs-137 deposition on the broad leaf sample media." According to the report, levels of Cs-137 have remained relatively constant in the samples tested over the past four years. This is to be expected, because that radionuclide has an incredibly long half-life. In 2012, 13 of 24 samples taken tested positive for Cs-137, up to 172 pCi/kg (a picocurie is a unit of radiation; approximately 27 pCi is equivalent to one Bequerel [Bq], a common unit of radioactivity). Samples taken in Orlando tested at levels up to 201 pCi/kg. In 2013, 15 of 24 samples tested positive for Cs-137, up to 147 pCi/kg, and the Orlando samples tested up to 258 pCi/kg. The most recent tests, in 2014, found Cs-137 in 16 of 24 samples, at levels up to 159 pCi/kg. The report specifically notes that the 2014 tests also found Cs-137 in grapefruits at concentrations of 4 pCi/kg. 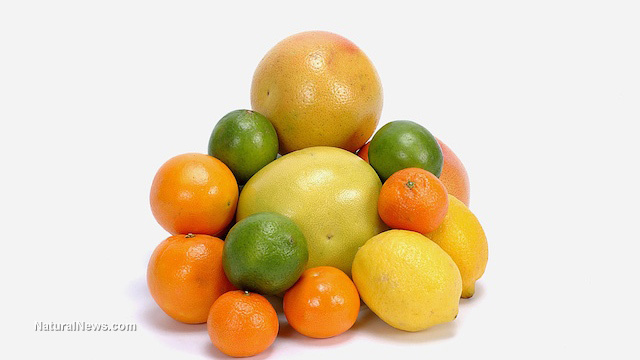 "It is not unusual to periodically see Cs-137 in citrus samples due to widespread deposition of Cs-137 from fallout due to past weapons testing and more recent from the Fukushima earthquake and tsunami event," the report reads. The levels of radiation detected are not necessarily a health concern in and of themselves. Many foods are naturally radioactive in small quantities; the most common radionuclides in food are potassium 40 (K-40) and radium 226 (Ra-226). The levels found in the Florida vegetation are lower, for example, than the 390 pCi/kg of K-40 typically found in beer, and far lower than the 3,500 or so pCi/kg found in bananas, carrots and white potatoes. Brazil nuts are particularly radioactive, at 5,600 pCi/kg of K-40 and up to 7,000 pCi/kg of Ra-226. After the Chernobyl disaster, the FDA seized and destroyed any foods that tested at higher than 10,000 pCi/kg. What is troubling about the Florida report is the evidence of how far radionuclides from Fukushima have spread. In addition, no level of radiation is truly safe, and any increase in exposure contributes to cumulative lifetime risk. Similarly, a study conducted in February 2015 showed the first evidence that radioactivity from the Fukushima disaster has reached the North American coast. The levels of Cs-137 detected in the waters off Vancouver Island were six times higher than the base level – itself an artifact of decades of nuclear testing. Radioactive cesium does not naturally occur on earth, and is solely the result of human activity. A 2013 study by the Nansen Environmental and Remote Sensing Center in Norway found that the radioactive ocean plume produced by the Fukushima disaster is likely to hit the west coast of North America by 2017, and the bulk of that plume will remain there through at least 2026.